Last month's awarding of the 2020 Olympic Games to Tokyo could be great news for technology. Pushed by a desire to showcase their expertise to the world, some of the country's biggest companies are now targeting 2020 for the deployment of new technologies that could revolutionize mobile telecommunications, consumer electronics, automobiles and even the way people watch the Olympic Games on television. 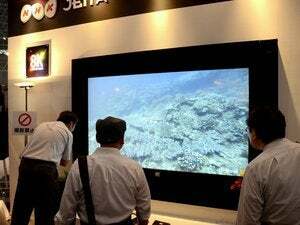 In a series of presentations at the Ceatec 2013 electronics expo in Japan this week, companies outlined their plans for cell phones that transmit data 100 times faster than today, TV pictures with 16 times as much detail as current high-definition and cars that drive themselves. They might sound like fanciful dreams, but consider what happened last time Japan hosted the Olympic Games. In 1964, the country undertook a massive infrastructure program that included building the famous Shinkansen bullet train, numerous subway lines in Tokyo, an expressway system through the city and hotels and facilities for visitors. Back then, technology wasn't nearly as pervasive as it is today, but the 1964 games were notable as the first to be broadcast overseas via satellite and in color. And so again in 2020, the Olympic Games might serve to push forward television technology. While TV makers are currently promoting "4K" or "Ultra HD" sets, which offer four times the level of detail of current HDTVs, Japan's national public broadcaster NHK (Nippon Hoso Kyokai) is close to beginning trial service of a system with 16 times the level of detail. Called "Super Hi-Vision" or "8K," the technology has been under development for years and test transmissions are due to begin in 2016. By 2020, NHK hopes it will be able to cover the Olympic Games using the new system. Super Hi-Vision already received a limited trial at last year's London Olympics, where NHK and the BBC produced several hours of programming per day and beamed it to public viewing sites in each country, so the chances are good that NHK will meet its plan. TDK this week showed off a new hard-disk drive recording system developed with Seagate that adds a laser to the traditional magnetic recording head. The result is that more data can be crammed onto a disk. The company said it "wasn't a dream" that 40 terabyte drives would be possible by 2020. Why 40TBs? That's the amount of space TDK envisages will be needed to record all Olympic competition transmitted using NHK's new Super Hi-Vision service. NTT DoCoMo, Japan's biggest mobile telecom network operator, is targeting 2020 for the introduction of a "5G" cellular phone service. Designed to work in outdoor, urban areas like Tokyo, the system will boast data rates of between 1Gbps and 10Gbps, but DoCoMo admits there are several hurdles it needs to overcome to realize the technology. At present it exists solely as a computer simulation. And if Nissan has it's way, the streets of Tokyo won't just be transformed by Olympic spectators when 2020 comes around. The company is working on an autonomous driving technology for cars that will allow automobiles to drive themselves. The cars, equipped with five cameras, five laser sensors and an electronic map, are already working on test tracks and were demonstrated at Ceatec. Production vehicles could be on the road by 2020. Tokyo has already hinted that high-tech will be part of the Olympics. At a news conference in Buenos Aires shortly before the Olympic committee voted on the 2020 host city, Japanese Olympian Yuki Ota, a double silver medalist in Fencing, demonstrated a small humanoid robot called Mirata. Mirata is the same type of robot as Kirobo, developed by Toyota and recently sent to the International Space Station.